I’ve been watching video profiles this week on The Today Show – interviews with the people featured in Richard Cohen’s new book, “Strong at the Broken Places.” Cohen, a journalist, who has had MS for over 20 years and two bouts of cancer, wrote this book as a follow-up to his previous, “Blindsided.” After the publication of that book the response showed him that the public wanted to hear from people who live bravely with the challenges of illness, and that there are many people in the isolated world of illness who want to share their story. 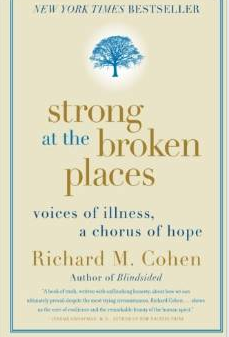 “Strong at the Broken Places,” Cohen says came from this desire of the many to share their stories in the hope that the sick, and those who love them, will see that they are not alone. Diabetes is not represented in the five profiles but there are lessons for all of us to take away from those featured: Denise, a sufferer of ALS, Buzz with non-Hodgkin’s lymphoma, Sarah, a social worker in the poorest areas of Cleveland with Crohn’s disease; Ben, a college student with muscular dystrophy; and Larry, whose bipolar disorder is hidden within. The five vary in age and gender, race and economic status, but they share a determinion to live life on their own terms. Intimately involved with these patients’ lives, Cohen formed intense relationships with each and shared joy even in heart-breaking situations. Though each individual’s illness wreaks havoc in a different way, Cohen shows how their experiences are strikingly similar and offer lessons—on self-determination, on courage in the face of adversity and public ignorance, on keeping hope alive, and on finding strength and peace under the most difficult circumstances. Lessons we can certainly profit from living with diabetes. The title, “strong at the broken places,” Cohen says, means we are stronger than we think. The series is likely to continue through the week on The Today Show since Cohen is married to host, Meredith Viera, and living with chronic illness appears to be coming more into the public eye.